The grammar book for the 21st century has arrived, from the language experts at Farlex International and TheFreeDictionary.com, the trusted reference destination with 1 billion+ annual visits. Farlex brings you the most comprehensive grammar guide yet: all the rules of English grammar, explained in simple, easy-to-understand terms. Over 500 pages of proper grammar instruction-2X more than the leading grammar book! Whether you're an expert or a beginner, there's always something new to learn when it comes to the always-evolving English language. Don't rely on multiple incomplete textbooks that contradict each other-fill in all the gaps in your grammar knowledge with one go-to guide. 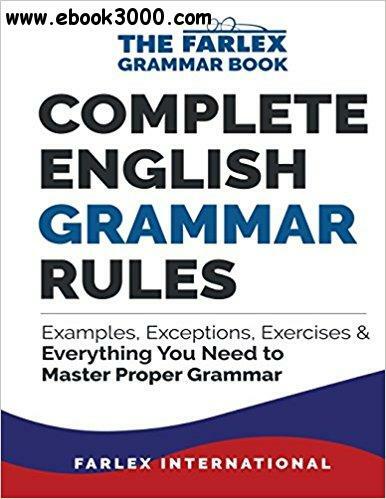 Only Complete English Grammar Rules gives you key exceptions, common grammar mistakes, thousands of real-world examples, and hundreds of grammar quizzes designed to help you retain what you've learned. Quickly master basic English grammar and tackle more advanced topics. Properly use every type of noun, verb, and even the most obscure grammar elements. Master verb tenses, including irregular verbs and exceptions. Immediately put your skills into action! Become a more effective writer and communicator in school, at work, and in everyday conversation.